Taking the first step is often the hardest: getting data from Excel into R.
Suppose you would like to use the ChainLadder package to forecast future claims payments for a run-off triangle that you have stored in Excel. How do you get the triangle into R and execute a reserving function, such as MackChainLadder? Well, there are many ways to do this and the ChainLadder package vignette, as well as the R manual on Data Import/Export has all of the details, but here is a quick and dirty solution using a CSV-file. Open a new Excel workbook and copy your triangle into cell A1, with the first column being the accident or origin period and the first row describing the development period or age. You find an example CSV-file on GitHub. Ok, the data is in R, but now you have to convert it into a triangle. A triangle is basically a matrix with extra attributes. To do this execute the following steps. 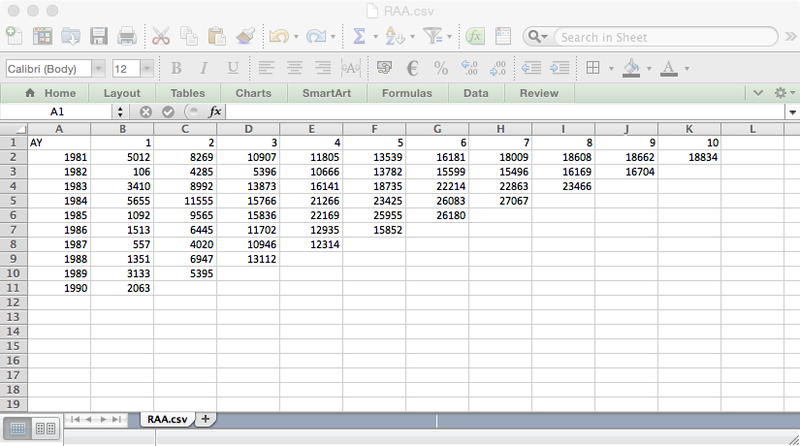 Go back to Excel and hit <Ctrl> + V on your keyboard to paste the data into R.
For more details see the package vignette and Dan’s post on pasting triangles from Excel into R via the clipboard. If you are after a thorough overview of R in insurance take a look at the book Computational Actuarial Science with R.
Finally, join the Special Interest Group on using R in actuarial science and insurance to share your questions and answers.